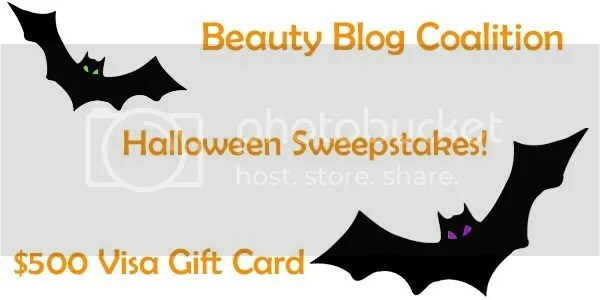 Beauty Blog Coalition Halloween Sweepstakes– $500 Visa Winner! OPEN! The ladies of the Beauty Blog Coalition have teamed up once again to host another sweepstakes for our dear readers! The Beauty Blog Coalition Halloween Sweepstakes begins today, 17 October and will end on 1 November 2012. One winner will receive a $500 USD Visa Gift Card! All terms and conditions may be found at the bottom of the Rafflecopter widget. Please allow the widget to load in full. You may enter on any of the participating blogs below – Rafflecopter will not allow you to enter twice. You may tweet about the giveaway (the last option in the Rafflecopter) every day for extra entries! Boooo-ty Blog Coalition Halloween Link Up: This is Halloween by NbL Swatches + Review Boooo-ty Blog Coalition: My Top 3 Glosses That Scream Halloween for 2012! Boooo-ty Blog Coalition Link Up: Fall Festival Coastal Scents Palette Pumpkin Spiced Eyeshadow Tutorial Glossybox USA April 2013 Open Box with Mini Reviews!